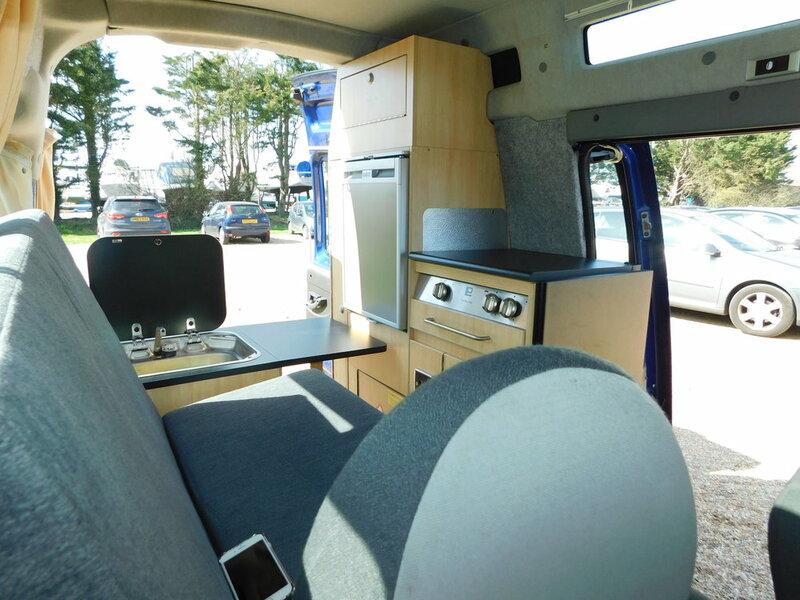 Danbury Fiat Doblo 2 Berth Hi Top Compact Campervan with Air Conditioning. 2007 and Only 46,300 miles from New. With the Economical 1.4 Litre Petrol Engine which means you can travel in the London Low Emission Zone. Complete with FSH, and in Stunning Condition throughout. Park and travel virtually anywhere. Located in Emsworth, Hampshire. We have everything to hand including a 2 burner Gas Hob, Gas Grill, Fridge with a Freezer box, Sink and Tap with Glass lid and Plenty of Worktop and Cupboard space. There are plenty of storage cupboards and areas all round. The Comfortable Sofa transforms into a small Double Bed which is 6 feet two inches long. We have plenty of windows all round with fitted curtains and there are Silver Screens for the Cab. There are also an ample amount of plug sockets for when you are hooked up to the electric on site. The Cab features Air Conditioning as well as Electric Windows and a Radio CD player complete with Bluetooth Hands Free phone operation, so Do Not Miss this Exceptionally rare and Desirable example. I would be happy to consider any part exchange that you have. Please give myself Stephen Delaney a call on 023 9421 4573 to discuss further and to arrange an appointment to view.